Description (GR): "So wrong for each other...and yet so right. No one knows what happened the night Echo Emerson went from popular girl with jock boyfriend to gossiped-about outsider with "freaky" scars on her arms. Even Echo can't remember the whole truth of that horrible night. All she knows is that she wants everything to go back to normal. 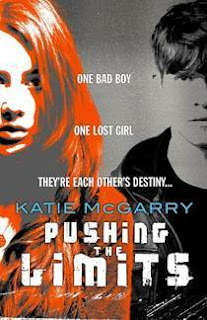 But when Noah Hutchins, the smoking-hot, girl-using loner in the black leather jacket, explodes into her life with his tough attitude and surprising understanding, Echo's world shifts in ways she could never have imagined. They should have nothing in common. And with the secrets they both keep, being together is pretty much impossible.Yet the crazy attraction between them refuses to go away. And Echo has to ask herself just how far they can push the limits and what she'll risk for the one guy who might teach her how to love again." I was never one to read contemporary YA. I think I simply got my fill when I was younger as we have a YA series written by famous teen book author (at least in Portugal) Maria Teresa Maia Gonzalez. She wrote numerous adventure type books featuring teenagers but she also wrote a series (called Profession: Teenager) in which she explores several subjects and problems that teens generally have: image in high school, bulimia, broken homes, among others. I always thought she had a very realistic outlook on these issues and I loved her books when I was younger. American contemporary YA is different. It generally follows the same structure: you have a boy and a girl one or both are troubled and they end up together and supporting each other through their problems. While I like this formula as much as the next person, the thing I loved most about Gonzalez's books was that romance was usually not needed for the characters to move forward; they do it by themselves. Also, in some books, the changes the characters go through aren't going to make everything peachy and sometimes they even make wrong choices. So why am I talking about another YA series in my review for Katie McGarry's "Pushing the Limits" you ask. Well, I just want to establish the background; the possible reason why I don't find "realistic YA" as enticing as many other people do. While they do bring up serious issues, I feel these books are so formulaic I end up not paying enough attention to the issues they address. "Pushing the Limits" suffers from the same problem. I mean it is obviously a love story so I don't get why exactly both characters need to be so troubled. And their issues are so... strange, or Echo's are anyway, a convergence of events so bizarre that it is probably quite rare in real life. But it was a nice read anyway. Echo and Noah's voices were realistic enough, likable enough and the issues were well explored. Overall: a typical contemporary/ realistic YA book that failed in its characterization and fell into the same old formulas for this kind of book. However, the writing was very good and Noah's choices at the end made him a lot more likable to me. It was a good book, but more of a romance book than a "let's explore teen issues" book.